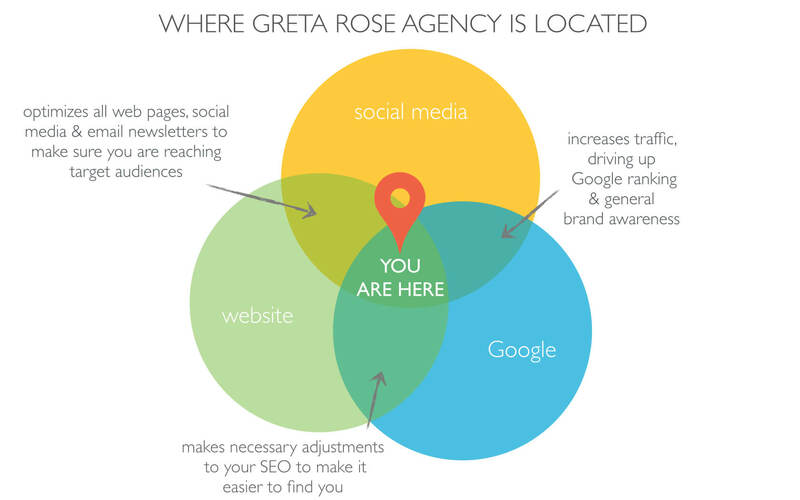 Greta Rose Agency is a creative agency founded by Greta Rose Zagarino, author of How to Manage Your Own Website, and expert in the industry of self-managed websites since 2006. We focus on integrating your online business with your entire business and specialize in design, development, strategy and support. Greta Rose engages projects and collaborates with strategic partners and consultants as needed to serve the needs of our clients around the globe. We are proud to serve a wide spectrum of creative clients, ranging from sole proprietors to international corporations. The mission of Greta Rose Agency is to provide the best assets and empower your company to master online technology in order to grow your business. For 15 years, my job has been to make you talk about the company I was working for. I am really good at my job. My job: To create a story compelling enough to capture your attention long enough for you to tell at least one other person. My Medium: Your website. I specialize in WordPress and eCommerce platforms. My Edge: I am a designer who creates in code. I am a techie with extensive experience in business development and social marketing. I am uniquely balanced between left brain functionality and right brain creativity. It’s not theory. I’ve lived and succeeded on both sides of the table. I helped raise $7.6 million dollars for charity in 4 years with a staff of 3 (average donation $51). I have generated stories that were featured on NBC Nightly News with Brian Williams, live feeds on Times Square, and talk shows (Rachel Ray, Howard Stern). I was the 2011 recipient of the Spearhead Medallion for Excellence in Service, 7th Annual Emerald Coast Salute to Special Operations Forces. I have worked for a billion-dollar money management firm in Beverly Hills, TV studios in Hollywood, George Lucas’ Industrial Light & Magic in northern California, Mike Milken’s Prostate Cancer Foundation in Santa Monica, and for a revolutionary technology company, RapidGiving. Greta Rose Agency has served over 100 clients across the US since opening our doors in 2013. You can read the testimonials here. We will inspire and strengthen your team, instilling a deep understanding of how your website, social media, and Google work together to produce your best results. We will design a beautiful website for you that makes you clap your hands and fist pump. It will be a future-forward site designed to achieve your business’ specific needs, proven by reliable reporting to confirm the effectiveness of your content. We will integrate and improve all of your systems, increasing the efficiency and quality of your brand. We will implement the coolest and latest sharing tools into your site, and teach you how to realistically share valuable content that your clients will actually appreciate. Perhaps your business could benefit from a versatile agency with a breadth of well-rounded business experience combined with a creative background, an enthusiasm for generating out-of-the-box solutions to the workplace, and a track record in taking ideas to reality and producing measurable results. you can use right now.